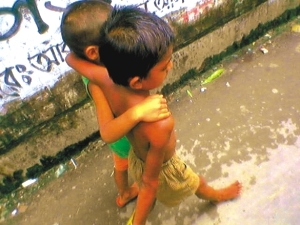 The condition of children in Bangladesh is not in a good state. Of course, Bangladesh is dedicated towards ensuring the children of their basic rights and things are gradually improving, but many factors, particularly poverty and the overall lack of people's awareness about the issue hinders this. The country is still unable to maintain a satisfactory situation to provide the children with rights such as their essential needs like food, shelter, education, recreation and a social environment to grow up properly. The situation of the children of marginalized groups, vulnerable and underprivileged groups, including urban slum dwellers, refugees, tribal groups and those living in remote and inaccessible areas of the country deserve special attention. Disabled children also experience discrimination in many forms, mostly because of ignorance among parents and the community. Children in institutions like orphanages also suffer from many problems as a result of poor management of such institutions, and lack of resources. Against this background, it is important for the country to put in place a rigorous child rights monitoring system that is capable of properly and regularly monitoring the progress. Initiatives focusing on the importance of communication and media involvement on the issue were necessary. The media has been a major player regarding the development and improvement of child rights in many countries. It is, of course, a powerful force and the importance of its involvement in regarding this issue is crucial. It can play a vital role in keeping people as well as well as the government aware of the rights and conditions of the children. The people behind the Mass Line Media centre strongly felt this. They felt that the media of the country provided insufficient focus on the child rights issues from all over the country. The need to expose the countrywide child rights conditions and issues and to increase the awareness of the people and media was strongly felt. And that's when Shishu Prokash was envisioned. Mass-line Media Centre (MMC), as a media-focused voluntary organization, was keen to address the child and adolescent rights issues to the people through distributing information through the media, both at the national and the local level. The organization, in cooperation with the UNICEF, established a dedicated news agency for the children named Shishu Prokash. Its vision was to strengthen children's participation in the media as well as to enhance both the quality and quantity of child development and rights-based coverage in the media of the country. It is the first ever children news agency in Asia. Shishu Prokash started its journey in the beginning of May. Later, it was officially launched through a colourful launching ceremony on 30 May 2005. Renowned media professionals, columnists, GO/NGO officials, civil society members, human rights activists, and journalists of both the national and local level participated in its launching ceremony. Shishu Prokash has a network of 646 child journalists spread throughout the country. In each of the 64 districts of the country, the journalists are arranged in groups of ten, each lead by a professional journalist. For this, Shishu Prokash had to find and train these children journalist from the beginning. The team leaders provided necessary information to the children on how to collect the information from different sources on different child rights issues from the local level, and also how to prepare a report. These child journalists are now working under the team leaders of the respective districts, creating in-depth reports and stories on child rights issues. One of the major objectives of Shishu Prokash was to highlight the child and adolescent rights issues in an increased manner through media towards establishing the child rights in the society. As a dedicated news agency Shishu Prokash was keen to pickup important child rights issues from local level through children journalists from all over the country. The need for reports and features about people's rights, especially children's needs was strongly felt. Shishu Prokash concentrated towards preparing issue-based and in-depth stories on child rights issues such as children in hazardous workplaces, children abused in domestic workplace, getting low payment, child trafficking, health and education of children and adolescent and other right focused issues in a regular manner. Shishu Prokash now covers issues like underprivileged children, working children, the children who've dropped out of education and the child acid-victims. Also the topics like children's health conditions, medical treatment, entertainment, education were covered. From finding and selecting the topics to collecting the information and creating the detailed reports, all these tasks are done by the child journalists with the help of the professional journalists acting as their team leaders. These reports are then sent to the local newspapers for publication. Several of the reports by the journalists of Shishu Prokash were published in the local newspapers. Shishu Prokash hopes that all the newspapers will feature the stories created by the 646 child journalists throughout the country. This, they think, can play a vital role in strengthening Bangladesh's progress in ensuring that the basic rights are fulfilled for the children. There were, however, some newspapers that didn't provided what they felt was "necessary coverage." A few days back, Shishu Prokash held a press conference urging the newspapers to increase the coverage. Apart from the reporting, Shishu Prokash also analyses the local media, especially the print media. Based on the information collected from the national newspapers and by processing the news items, trends of violation of child and adolescent rights are studied. The result data is kept in searchable databases and this comes in handy while the journalists are writing reports and stories. Shishu Prokash started its journey from May 2005, and will continue till December 2005. Throughout its journey, Shishu Prokash hopes to increase the coverage on child rights and conditions in the local media and believes that by doing this, the awareness of the people and the governing bodies can significantly increased.